Lucie the llama always gets picked last at recess and is feeling sad. She comes up with a plan to get the other kids to play with her. Lucie shows the kids something she can do and discovers that everyone is good at something. Written in rhyme and beautifully illustrated, Left Out Lucie is ideal for elementary school guidance counselors, classroom teachers and even speech therapists who can utilize the rhyming format for language lessons. Parents will appreciate Lucie's problem-solving ability. Interested in purchasing Left Out Lucie? Email Marybeth at marybeth.harrison4@gmail.com for more details. Hunterdon Review: "It rhymes, it's fun, and most importantly, it's a story almost all of us can relate to." 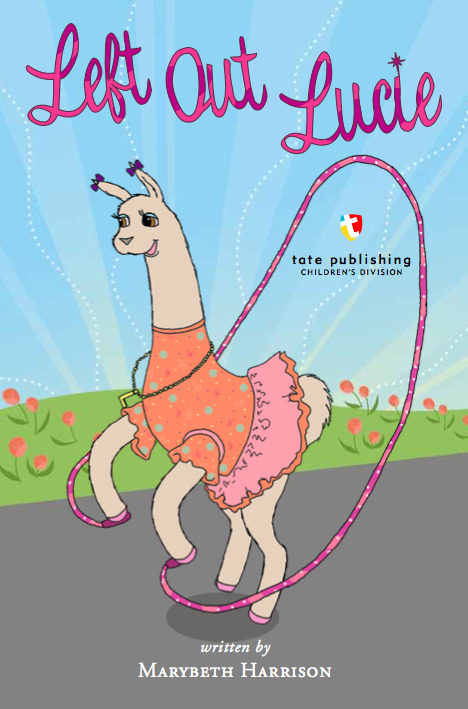 Speaking Of Speech: "This sweet 20-page, illustrated book tells the story in rhyme about a llama... Marybeth Harrison uses her story to encourage students to discover what they like to do and to seek friends who share that common interest." Inner Pieces Gallery: "Marybeth Harrison not only wrote Left Out Lucie, a Mom’s Choice Silver Award winning children’s book, she designed an entire K-3 program around it. I found so many things to love about Left Out Lucie."